NOTE: Pyrenees Quarries is a direct importer of most of these products, which are sourced from various international suppliers. 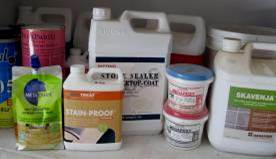 All products are of a very high quality and as we use ourselves. As a direct importer our pricing structure is extremely competitive. We offer a full money back guarantee. Advice on your stone problems freely given. 105, 115, 125, 150, 180, 200, 225mm (turbo, turbo with side teeth, segment, continuous rim, brazed – not all styles available with all sizes). 300, 350, 400, 450mm. Segmented blades. Available in steel or silent, wet and dry. Bore sizes from 25to 60mm. 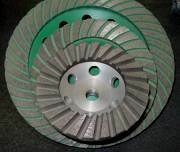 500, 600, 700, 800mm, All segmented Silent blades, wet use only, utilizing the latest sandwich segment with a modified diamond and matrix mix to be compatible for use on all stone types. 1000+mm, available special order, steel only. POINTING/RODDING BLADES: 125mm, 8 & 10mm widths. 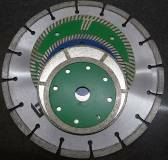 CONCAVE BLADES (Circle cutting), 125mm, 225mm. SCUPLTURE BLADES: 30, 40, 50mm diameters, 6mm straight shank. 100mm, 30/40#, 60/70#, 100/110#, M14 Thread, Turbo style, Steel & Aluminium body. 125mm, 30/40#, 60/70#, 100/110#, M14 Thread, Turbo style, Steel body. 150mm, 30/40#, M14 Thread, Turbo style, Steel body. 180mm, 30/40#, M14 Thread, Turbo style, Steel body. 5,6,8,10mm - blind hole – straight shank, M14 and ½” BSP connections. 15,20,25,30,35,40,45,50,60,70,80,90,100,115,130,150mm – core drills, straight shank. Some long hole saws and hole saws with ½” BSP and M14 thread available. Available sizes, 100mm and 125mm white matrix wet pads, 100 and 125mm dry pads, backer pads in rubber or aluminium to suit, other pads various sizes, all available grits. Pneumatic wet polishers etc also available. 80mm - 50#, 100#, 200#, 400#, 800#, 1500#, 3000#, Dry use, Velcrose backed (Floor Pads). Other plates to order, all grits available in all matrix types. Only some types and styles held in stock. Various tools available with ½” BSP and M14 thread, main usage to suit CNC machine operations. 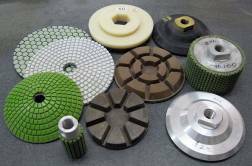 Diamond engraving bits, 20, 30, 50mm relief work diamond baldes, air chisels, diamond hand polishing pads, calcium carbide carving chisels (see below). Most commonly used stone masonry tools held in stock, including carving and building chisels etc. Very good sourcing ability for more uncommon stone working tools. A wide variety of other stone tools available, including adaptor pieces, router bits, rifling and bush hammer bits (and bush hammer pneumatic tool), water jackets, concave blades, 8&10mm pointing blades, silicon carbide antiquing brushes, stone glues, dyes etc. Slow demolition agent, for rock breaking and concrete demolition etc - no license required for use – silent, no fly rock, non explosive. Simply drill holes - no smaller than 32mm diameter - about 150mm apart - 75% of the way through the material to be cracked - mix agent with water - pour in hole - wait 24 hours plus for material to slowly crack. 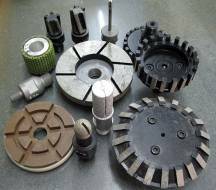 Wide range of conventional dimensional stone quarrying tools in stock. 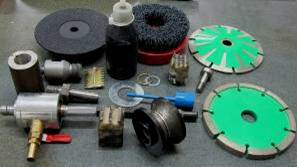 Items include drill caps, drill steels to 4.0m, pneumatic drills, pneumatic picks, feather and wedges (plugs and feathers) etc.